The following information is taken from Davis family records. The farm area was purchased in 1818 and approximately 50 acres were under cultivation; the rest was woodland. 1. Home built and used as a residence and tavern-inn. 1. Used primarily as a residence and tavern-inn. great-great-granddaughters of Goldsmith Davis, click here. General store was abandoned during his lifetime. The tavern stopped the sale of liquor, but meals were still served. Town meetings and elections continued until 1882 when the town became sufficiently large to hold elections in each district. In 1837 Lester Davis experimented with the silk industry. Planting Mulberry trees they tried to grow silk. A quote about the venture states, "Silk… we received some time since, skein of sewing silk, from Mr. Lester H. Davis of Corum, in Brookhaven. This silk which is pronounced of a fair quality, was manufactured from the cocoons in the family of Mr. Davis. He has now growing 100 white Italian maulberry trees about 60 of the Morna Multicalls. He fed about 500 worms the past summer, from which he manufactured 500 skeins of silk. Mr. Davis is confident of the success of the undertaking, and that the business will ultimately become to him a source of profit." foreground 2nd from right, and Homer Davis far right. Threshing - Long ago, horse driven treadmills were used on the farms of Long Island. A contractor would take his machine from farm to farm to do the threshing. Once he arrived at the farm, the contractor would unhitch his horse and put him on the treadmill. The treadmill stood at an incline and was locked so the horse could stand still. The mill would then be belted to the threshing machine. Once that was done the contractor would unlock the treadmill which would then start moving under the weight of the horse. This makes the animal walk while staying in place, just like a treadmill today. The movement of the horse helped to keep the treadmill moving and the threshing machine working. Every once in a while the horse was given a rest. 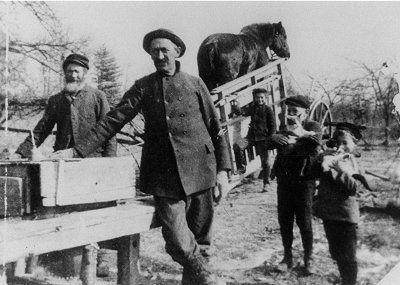 Once the job was finished, the horse was unhitched from the treadmill and had to then pull the wagon home. This process separated the seeds from grain and oats. It was also used to saw logs into planks. The milk from cows sold to hospitals. Hogs raised are sold to butchers. Wood for fuel sold also for ship timber and locust sold. Chickens were raised for personal use. Potatoes on the Davis farm. 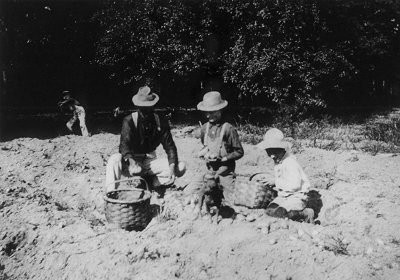 At rear, Charles R. Davis throwing potatoes. In front, Daniel R. Davis, Lester H. Davis II, and Homer Davis. Circa 1900. 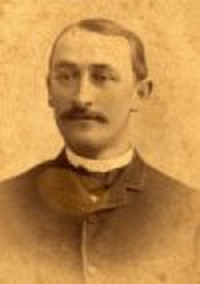 The last owner of the house, Lester H. Davis III (1926- ) kept a herd of 140 cows. He used to bring them across the street everyday to graze in the fields. Then in the 1960's, increasing traffic developed and he would need a police officer to stop traffic to let them pass. That and high taxes made him give up the dairy business. Eventually most of the farm was sold. A shopping center and houses were built on the former farm. A grant of $330,000 was obtained by members of the local civic organization to refurbish the house. In 1999, Brookhaven Town purchased the home plus 3/4 acres of land from Lester Davis III, and restoration efforts are basically completed for the exterior of the house itself. Planning for the interior is in the initial stages. Floor plans for the interior layout are available for viewing; click here. It is the goal of the Davis Town Meeting House Society and the Coram Civic Association working in tandem with the Town of Brookhaven Department of Parks & Recreation to restore the home to its former glory.